I recently had the chance to see the new Pixar animated-film Inside Out which I found beautiful and full of wonderful truth, but also asking important questions like, “just what purpose does sadness have in this life?” We all feel it, some more than others, and I had (have) to wrestle with the implications of that question: should I not just avoid sadness? Should I not just shove it in the corner of my soul and continue on in my own naive joy? Samuel Rutherford was a man who knew the co-existence of joy and sorrow all too well. A man who lost his wife and two children, who battled depression, and was exiled from his church congregation by the High Court, Rutherford knew both grief and hope. Quite different than despair, Rutherford’s sadness was characterized by longing. As I’ve read his letters, many have brought me to tears. There’s a joy amidst the sadness, and I’ve only been bettered by having read them (and I’d highly recommend them). In Inside Out, there was a moment that left me gutted. The imaginary-friend, Bing Bong, began grieving over the fact that he was removed from his creator’s consciousness and was left wandering in the maze of his creator’s unconscious memories. He was forgotten by the one who loved him. He was without purpose and without a friend. 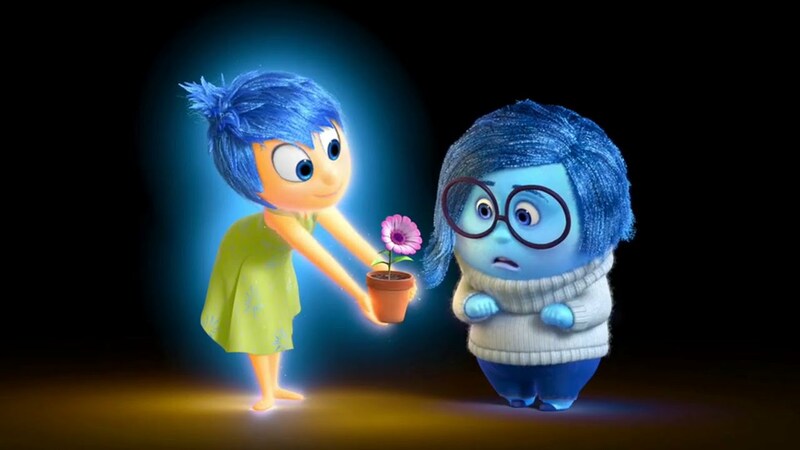 But for the first time in the film, Sadness found purpose. Sadness sat next to him and allowed him to grieve, to cry, and to just recognize the sadness that should rightfully exist in him. It’s good to recognize our unfulfilled desires for things like friendship and a place of belonging. Like Sadness and Bing Bong’s conversation there’s relief in those expressions of grief. For some reason, we heal by acknowledging our troubles. Like Rutherford’s own troubles expressed in his letters, I was offered consolation and the space to feel sad for want of restoration. But why? Why is there relief in recognition of something that doesn’t necessarily have an immediate answer or resolution? The most profoundly troubling thing in Inside Out for me was that Bing Bong was eventually forgotten entirely. There was no resolution for him. He fell into a pit of oblivion. Literally. So why would recognizing that there are things in my life that are painful be of any use to me? Why would longing for what was or what could be leave me any better than not longing at all? If not for a future hope, I can’t honestly say I’d be able to live consciously with sadness. If my future is like Bing Bong’s, what’s the point of sadness? If not for a future hope, all joy is worldly, temporary joy. I’m with Rutherford on that, and yet, a future hope is nothing without grounding. What does it mean when I’m told to just “keep on keeping on” if keeping on just means I’ll eventually hit a dead-end? I, like Rutherford, long for the intimate kiss of Jesus, for His – already but not yet – embrace of me, and I’m only assured of that by an objective reality in the cross. The cross that “smelleth so sweet,” so sweet, yet so painful. A cross that was bore for us that we may experience lasting joy, but a cross that we too must bear. Sadness has a purpose, for I suppose that without sadness in this life we can’t experience real joy. Without sadness, hope is nonexistent, or to give an example, I’d never long for intimacy if I never felt lonely. A severance of longing, or numbing, is one great way to defeat real joy. Attempting to fill our ultimate longing with things that will never fill it is another. Longing contains both joy and sadness, and I’d never long for Jesus without recognizing my own longings. To recognize those longings, or to grieve, is often excruciating, but I’d never need Jesus without that need. We can’t remove sadness without also removing joy. We can’t long without suffering. We can’t be kissed without the cross.